Is now available for pre-order! SOLD OUT! THANK YOU!!! PDF coming soon! 8-track to play "Sister Golden Hair"
As I mentioned, we are hoping to assemble kits during the month of May and have everything shipped by mid-June. In some ways, the shipping date depends on how many orders come in. If a lot of orders come in, we may have to order more crewel wool (which comes from England) and that will take some extra time. But the first people to order will be the first to receive their kits, so I really encourage you not to wait to order. Our kits always sell out, and I want to make sure that everyone who wants one gets one. I'll leave the pre-orders open until May 10. As usual, we will ship overseas. To see the shipping costs for your location, just place the items in your cart and choose your location (or enter your zip code, if you are in the U.S.) and it will tell you how much the shipping is. Also as usual, I have a sincere request: Please check on and update your shipping address correctly in your Paypal preferences so that there is no confusion when we go to ship. We have a kind of a complicated system for making sure that everyone gets what they ordered on time, and post-ordering emails requesting address changes really mess with that when there are a lot of orders coming in at once, so if you can get it all straight before placing your order, I would be ever so very, very grateful. Thank you. I spent all day yesterday trying to untangle the complicated shopping cart system I have going on in my web shop. There are three different genres of things for sale in the shop: Kits and supplies, downloadable crochet patterns, and downloadable sewing patterns. Kits and supplies orders that need to be physically shipped go directly through Paypal. To view the cart for them, click on the button at the top of the site that says "View Cart for Kits and Supplies." 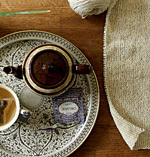 Crochet patterns go through Ravelry and are purchased one at a time. Sewing patterns go through another digital products service and can be purchased several at a time; to view the cart for them, click on the button at the top of the site that says "View Cart for Patterns Only." Kind of complicated, I know, but I'm going to try to reconfigure my shopping system this summer. If you have any confusion, just let me know and I will help steer you in the right direction. A downloadable PDF of the Daisychain ABCs sampler pattern ONLY (not the kit, just the pattern) will be available, but not until sometime in June, after all of the kits have been shipped. I absolutely loved making this. It is not hard, but it will keep you happy/busy for a while. That's what embroidery is all about, for me. I think we all need quiet time in life to do pretty little things like this. I know I do. What else. I think that's it. My brain is fried. If you have any questions, just let me know! Thank you!!! Is this a project for beginners? Well, my answer to that is always, if you love it you can do it — embroidery just takes practice, you can rip out and redo anything you don't like, and there are illustrations to help you work through all of the stitches (which are quite basic: stem stitch, backstitch, satin stitch, French knot, chain stitch, and lazy daisy, among a few others). That said, it's a fairly big piece (the frame in my photos is 11" x 17", to give you an idea of scale) with some small, detailed parts, so it's a bit ambitious in that way. But, you know, of course I think you can do it! Can you recommend a good beginner's embroidery book? Why, yes! There is an absolutely wonderful book called Embroidery Companion: Classic Designs for Modern Living by Alicia Paulson that you will just love!!! Will the hoop and scissors and twill tape ship separately, or with the kit? The supplies will ship with the kits, in June. Will this be available later, or again next year? Probably not. I'll be onto something else by then. What are the finished dimensions? The sampler is designed to fit into an 11" x 14" frame. There is a 3" margin of fabric all the way around the design area to give you something to hold onto while you're stitching, and to help with stretching during the framing phase. And yes, I will definitely be doing a framing tutorial for you in the coming weeks. :-) Okay, back Monday! Thank you! May 10, 2011 Update: The kits are completely sold out now. THANK YOU to everyone who pre-ordered! The PDF of the pattern only will be available soon. Thank you! This sampler is just too, too sweet! I've been loving it since you first showed us a glimpse and was thrilled when you started printing them up! I just placed my order~now I just wait for my kit, some sun, find myself a porch and a halter top and we're good too go! Oh, Alicia, you do the nicest work! I love your aesthetic of bright, cheery pastels against an interesting muddy neutral color. Works every time! I also just placed my order - and I can't wait to get started! This is just too cute! Oh, it's awesome! The colors are so wonderful! Hello- I'd like to pre-order the kit, but I will be gone till August. Can you hold down the shipment until I return to my home! Thanks! I think I am going to cancel all plans for the day and just stare at this sweet, beautiful alphabet. You really do have an eye for color. ps. know of any cute patterns for halter tops? I've been drooling ever since you showed us a sneak peek - looking forward to retweaking my embroidery skills with this to encourage me! Please let me know where I can order some WARM WEATHER too!!!!! I just love that "ellemmenno" is by itself in the middle of the sampler! Oh my gosh! I LOVE this sampler. It is absolutely adorable! I even know the perfect spot to hang it! Alicia, it sounds like this might be well-suited for a beginner -- is that true? I think it's the sweetest thing, but I don't know a thing about embroidery! I hope our warm weather returns this weekend. COME ON PORTLAND, WE'RE DYING HERE. Love it. Bought it. SO EXCITED!!! Yay! Just ordered mine and have started the countdown to shipping! Can't wait! Thank you for such an adorable summer project. This is so lovely! Excellent work. I have never embroidered, but this WILL be my first piece. It's just gorgeous. I love your designs and overall style. Lovely. I LOVE it!!! I want to do one so badly, but I have no clue how to embroider (I can sew though!). Is it beginner friendly? Just ordered. Your first kit I've ever bought. I'm excited! This is very beautiful. Old fashioned yet modern still. 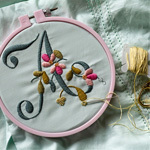 What is the difference between "embroidery" and "crewelwork"? Is it just the type of floss/thread used? Just placed my order. I love this so much! I can't wait to work on it. Thank you! Yay! Must go search for a halter top designed for grannies ;)(maybe one with 3/4 sleeves and a turtleneck ;), so I can go to work on this the minute it arrives. I have a well-known weakness for alphabet samplers. I just may have to order this. Your supply list is too cute! I haven't done embroidery or crewel work for years. Mostly, I quilt and crochet, but your Ornament kits were such a blast! I'm awaiting my order and my fingers are itching. What's next? OHHHHHHH! Another ornament kit?